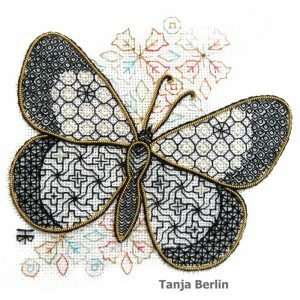 The Flight of a Butterfly blackwork design is an intermediate design in my blackwork art embroidery kits. 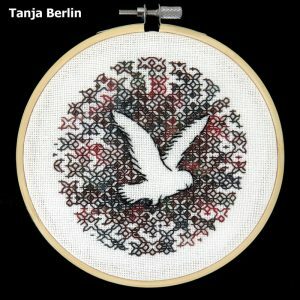 Blackwork is a counted form of hand embroidery in which interesting blackwork patterns are worked on the wings, body and flight trail and then areas outlined with metal threads such as pearl purl and twist. 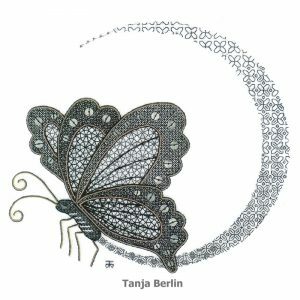 In the kit I provide a detailed instruction booklet with 19 pages of step-by-step diagrams and instructions on how to work the tacking, each blackwork pattern and the outlines on the butterfly. 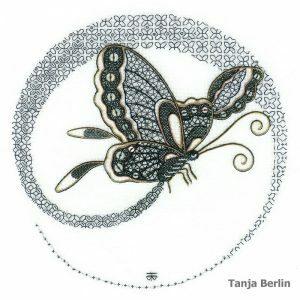 The Spectral Butterfly blackwork design is an intermediate design in my blackwork art embroidery kits. 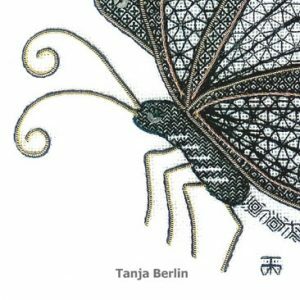 In the kit I provide a detailed instruction booklet with 21 pages of step-by-step diagrams and instructions on how to work the tacking, each blackwork pattern and the outlines on the butterfly. 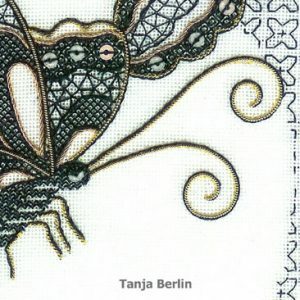 The Introductory to Blackwork – Small Blackwork Butterfly design is a Level 1: Beginners of my Further Education kits in which you have the option of purchasing the 3 PDF files with colour work-in-progress pictures of the entire stitching process on my butterfly that I provide when I run my on-line classes. 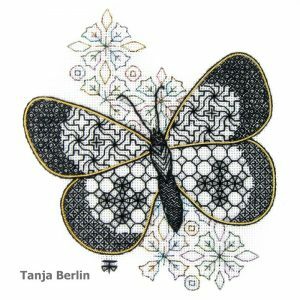 The butterfly is a counted form of hand embroidery in which interesting blackwork patterns are worked on the wings, body and flowers and then areas outlined with pearl purl and stem stitch. 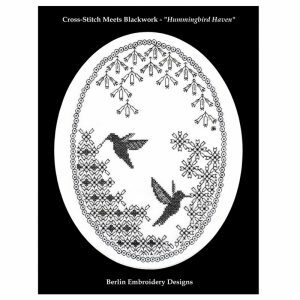 The Blackwork Chickadee design is an advanced design in my blackwork art embroidery kits. 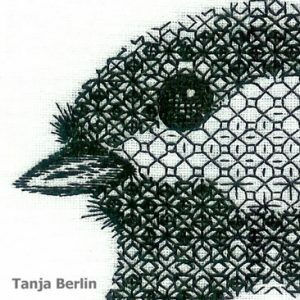 The Chickadee is a counted form of hand embroidery in which interesting blackwork patterns are worked on the bird. 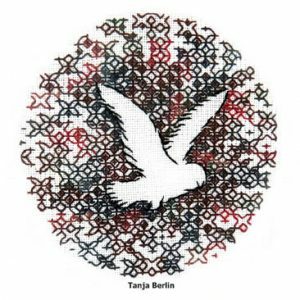 Dimension is achieved by changing the thickness of the embroidery thread and the density of the pattern, creating a realistic design. 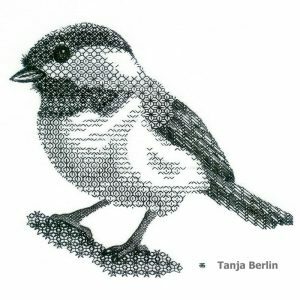 In the kit I provide a detailed instruction booklet with 24 pages of step-by-step diagrams and instructions on how to work the tacking and the blackwork patterns on the chickadee. 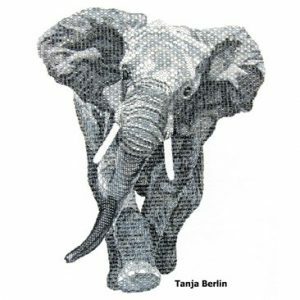 The Blackwork Elephant design is a Level 4: Expert of my Further Education designs. 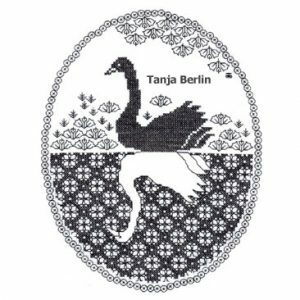 You will require experience in the tissue paper transfer method of working a blackwork design and experience in shading blackwork patterns by changing the density of the pattern and the thickness of the thread. 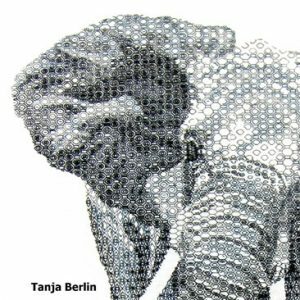 The elephant is worked from an instruction booklet which has step by step numbered charts for the patterns as well as from PDF files with work-in-progress photos of the patterns on the elephant. 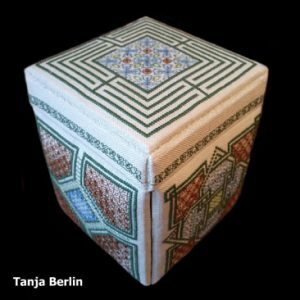 The Blackwork Etui Box can be worked by any level of stitcher. For beginners I suggest working the patterns on 16 count Aida fabric and experienced stitchers can work the patterns on 32 count Belfast linen fabric. 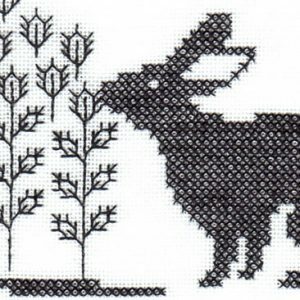 There are set blackwork patterns for certain panels of the boxes, and the instruction booklet has step-by-step numbered diagrams and instructions to guide you through the blackwork patterns. Other panels of the box are covered with cotton fabric of your own choice (the cotton fabric is not supplied in the kit). There are instructions on how to construct the box once the stitching is complete. 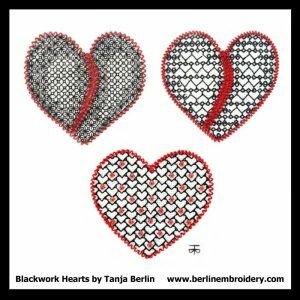 The Blackwork Fuchsia design is an intermediate design in my blackwork art embroidery kits. 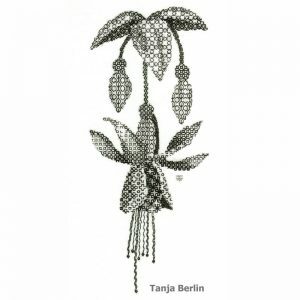 The fuchsia is a counted form of hand embroidery in which interesting blackwork patterns are worked on the flower. Dimension is achieved by changing the thickness of the embroidery thread and the density of the pattern, creating a realistic design. Gold thread is used to highlight areas of the design. 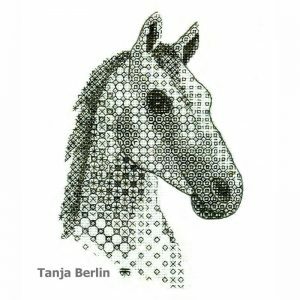 The Blackwork Horse – Mangalarga Breed is a beginners blackwork design. 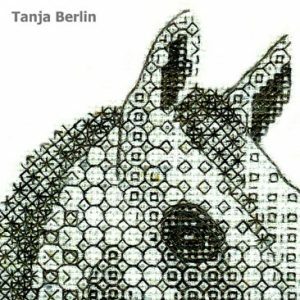 In the kit I provide a detailed instruction booklet with 19 pages of step-by-step diagrams and instructions on how to work the tacking, each blackwork pattern and the outlines on the horse. 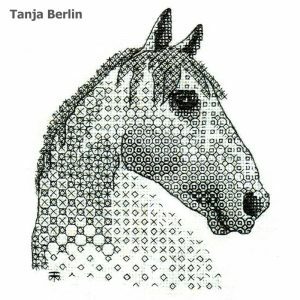 The Blackwork Horse – Russian Trotter Breed is a beginners blackwork design. 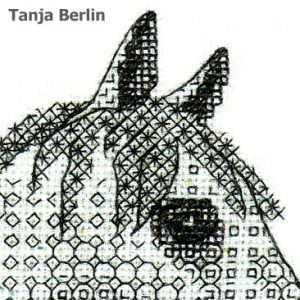 I only have a chart available for this design. 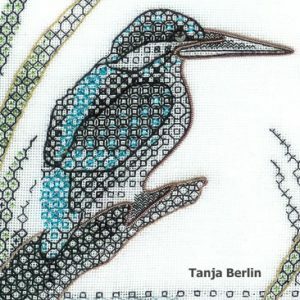 The Blackwork Kingfisher design is an advanced design in my blackwork art embroidery kits. 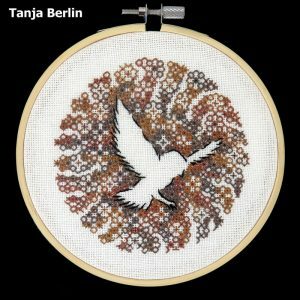 Blackwork is a counted form of hand embroidery in which interesting blackwork patterns are worked on the kingfisher and background in black and coloured metallic threads and then areas are outlined with metal threads such as pearl purl and twist. 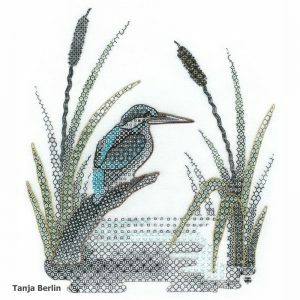 In the kit I provide a detailed instruction booklet with 24 pages of step-by-step diagrams and instructions on how to work the tacking, each blackwork pattern and the outlines on the kingfisher design. 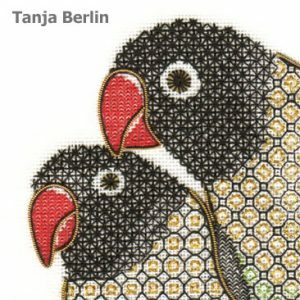 The Blackwork Lovebirds – “Just the Two of Us” design is a Level 2: Intermediate of my Further Education kits in which you have the option of purchasing the 5 PDF files with colour work-in-progress pictures of the entire stitching process on my lovebirds that I provide when I run my on-line classes. 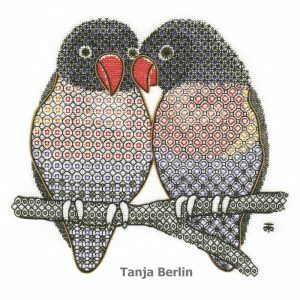 The lovebirds is a counted form of hand embroidery in which interesting blackwork patterns are worked on the birds in black and coloured silk and metallic threads and then areas are outlined with pearl purl and stem stitch. 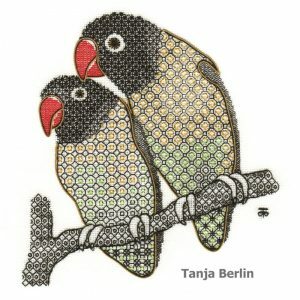 The Blackwork Lovebirds – “What You Looking At?” design is an intermediate design in my blackwork art embroidery kits. 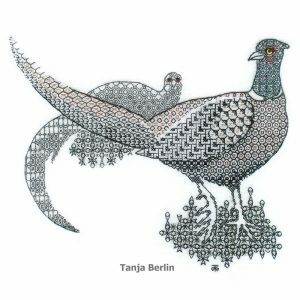 In the kit I provide a detailed instruction booklet with 26 pages of step-by-step diagrams and instructions on how to work the tacking, each blackwork pattern and the outlines on the lovebirds. 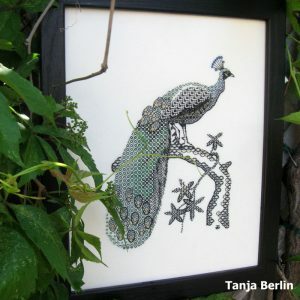 The Blackwork Peacock design is an advanced design in my blackwork art embroidery kits. 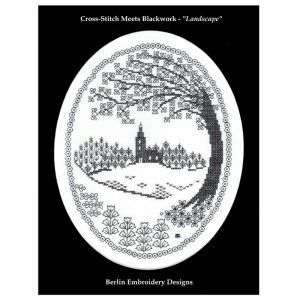 Blackwork is a counted form of hand embroidery in which interesting blackwork patterns are worked on the body and branch in black and coloured metallic threads and then areas are outlined with stem stitch. 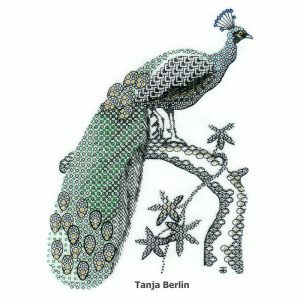 In the kit I provide a detailed instruction booklet with 27 pages of step-by-step diagrams and instructions on how to work the tacking, each blackwork pattern and the outlines on the peacock. 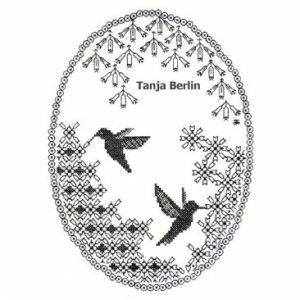 The Blackwork Silhouette Design – Owl Flying is the first in a series of four designs that tell a story…….an owl is flying and spots a rabbit running, it swoops down and goes in for the catch. 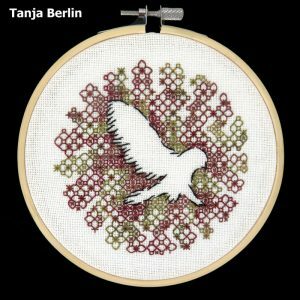 The Blackwork Silhouette Design – Owl Swooping is the second in a series of four designs that tell a story…….an owl is flying and spots a rabbit running, it swoops down and goes in for the catch. 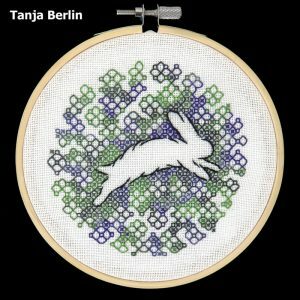 The Blackwork Silhouette Design – Rabbit Running is the last in a series of four designs that tell a story…….an owl is flying and spots a rabbit running, it swoops down and goes in for the catch. 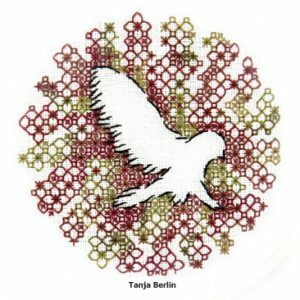 Downloadable PDF File for the Blackwork Silhouette Design – Owl Flying. 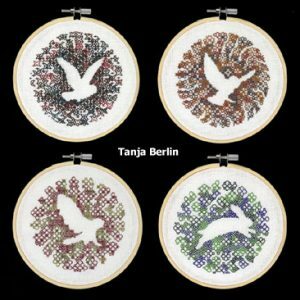 Downloadable PDF File for the Blackwork Silhouette Design – Owl swooping. 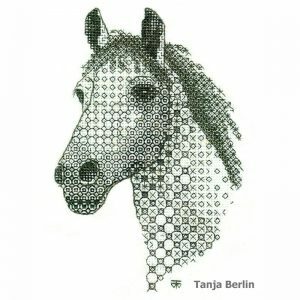 The design is the most intricate of the four design and beginners might find the design challenging. The design is worked from a chart and a detailed instruction booklet which has step-by-step numbered diagrams and instructions to guide you through the embroidery. 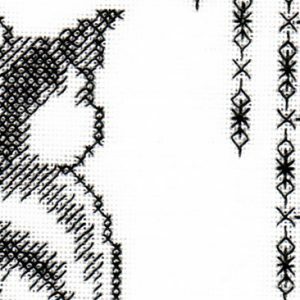 Downloadable PDF File for the Blackwork Silhouette Design – Owl Catching. 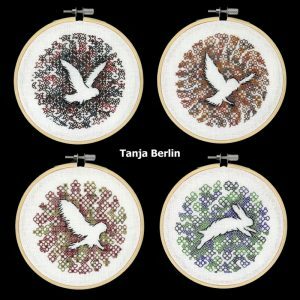 The Blackwork Silhouette Designs – Owls and Rabbit are beginners blackwork designs worked in Waterlilies silk threads on 28 count Lugana fabric and each design fits nicely in a 5 inch embroidery hoop and can be framed in the hoop. 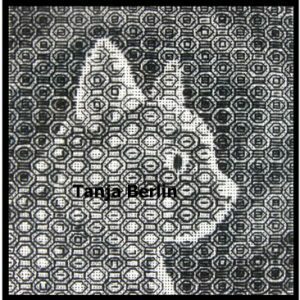 The designs are worked directly from a set chart rather that in the tissue paper transfer method that my blackwork art embroideries are worked. Accompanying the chart is a detailed instruction booklet which has step-by-step numbered diagrams and instructions to guide you through the embroidery. 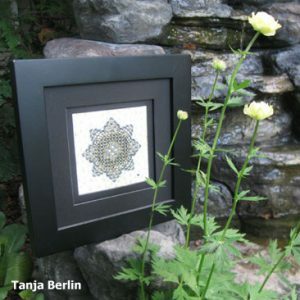 The Blackwork Star is a beginners design that is worked from a chart. 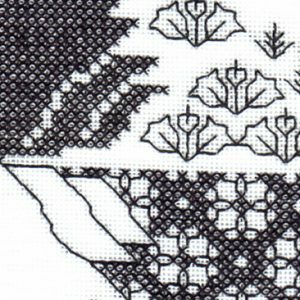 Accompanying the chart are detailed instructions with step-by-step instructions and diagrams on how to work the blackwork star. 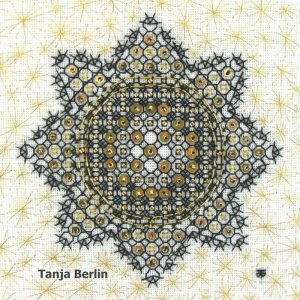 The star is embellished with gold spangles and beads and Japan thread and the background is worked in random stitched gold stars. 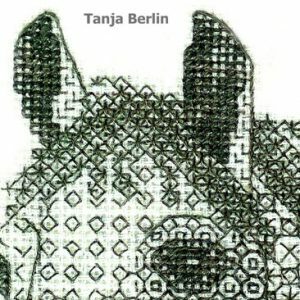 The Blackwork Study of Cats design is a Level 3: Advanced of my Further Education kits and is an excellent design to work prior to the Blackwork Elephant as it uses the same patterns and shading method. 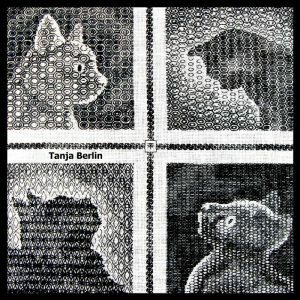 Each cat has its own blackwork pattern, dimension is created by changing the thickness of the thread and changing the density of the pattern. 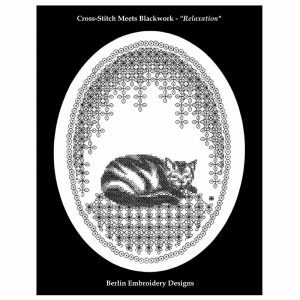 The design is worked from a hard copy instruction booklet which has step by step numbered charts of the blackwork patterns accompanied by five PDF files with work-in-progress photos of the patterns on each cat. 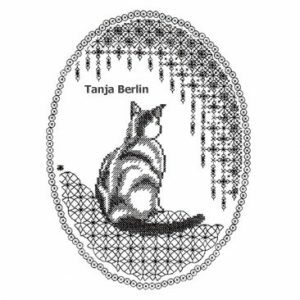 The Contemplation Cat is worked from a chart and has a detailed instruction booklet which has step-by-step numbered diagrams and instructions to guide you through the blackwork patterns. The embroidery can be worked in colour if you do not like black. 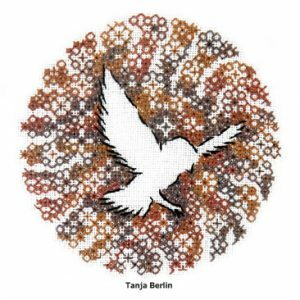 The Hummingbird Haven is worked from a chart and has a detailed instruction booklet which has step-by-step numbered diagrams and instructions to guide you through the blackwork patterns. The embroidery can be worked in colour if you do not like black. 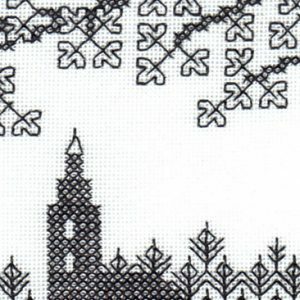 The Landscape is worked from a chart and has a detailed instruction booklet which has step-by-step numbered diagrams and instructions to guide you through the blackwork patterns. The embroidery can be worked in colour if you do not like black. 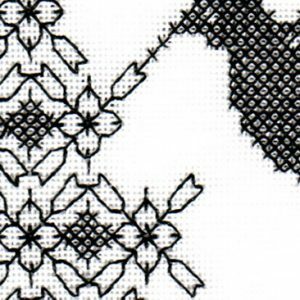 The Swan Reflections is worked from a chart and has a detailed instruction booklet which has step-by-step numbered diagrams and instructions to guide you through the blackwork patterns. The embroidery can be worked in colour if you do not like black. 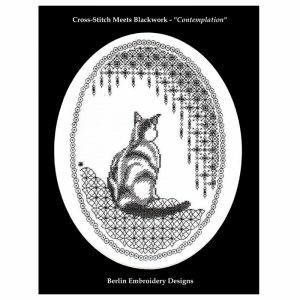 Downloadable PDF Pattern for the Blackwork Cat – Contemplation. 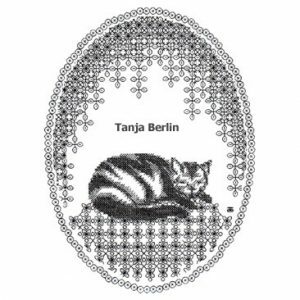 The cat design is good for beginners, it is worked from a chart and has a detailed instruction booklet which has step-by-step numbered diagrams and instructions to guide you through the blackwork patterns. 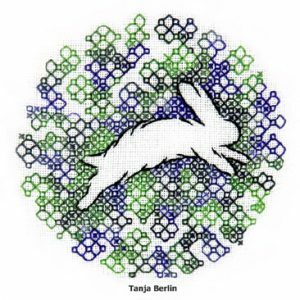 Downloadable PDF Pattern for the Rabbits – Going About their Business. 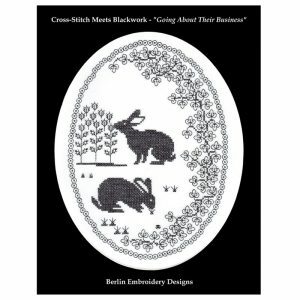 The Going About Their Business design is good for beginners, it is worked from a chart and has a detailed instruction booklet which has step-by-step numbered diagrams and instructions to guide you through the blackwork patterns. 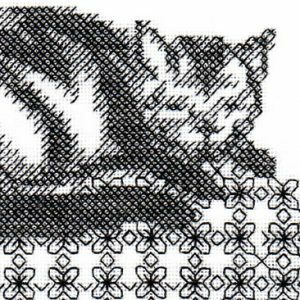 Downloadable PDF Pattern for the Blackwork Cat – Relaxation. 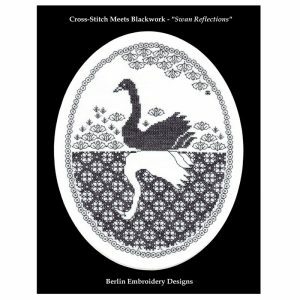 Downloadable PDF Pattern for the Blackwork Swan Reflections. The Swan Reflections design is intricate in places so might be challenging for beginners. 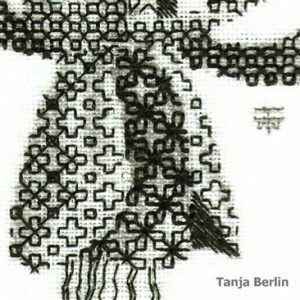 The design is worked from a chart and has a detailed instruction booklet which has step-by-step numbered diagrams and instructions to guide you through the blackwork patterns.